What’s your worst computer repair nightmare? If you’re anything like me, you need your computer. You can’t live without it whether for work or for keeping up with your friends. When it breaks down, you probably could not survive without a service agreement, but then, when you call for action, you’re on hold for 20 minutes, you then get a responder who gets your name and other details, you’re switched to the techie, and you wonder why the Dell or HP or Lenovo did not hire someone from Nebraska who speaks English like you and who can therefore get with the program quickly. And then, to boot, you’re disconnected. This is the dilemma facing Asger Holm (Jakob Cedergren). It’s not that this police officer in Denmark needs a techie. In fact things are even more hairy. He is a desk cop assigned to emergency help, a demotion because he is himself on trial for overstepping police boundaries. He is on the phone almost all the time, just like you with your computer repair person. He brings his demons to the phone calls and this time in an effort to redeem himself after what he did, he oversteps boundaries once again. Now, however, he is doing the right thing and might even get enough of a commendation to receive a mere slap on the wrist for his other alleged crime. 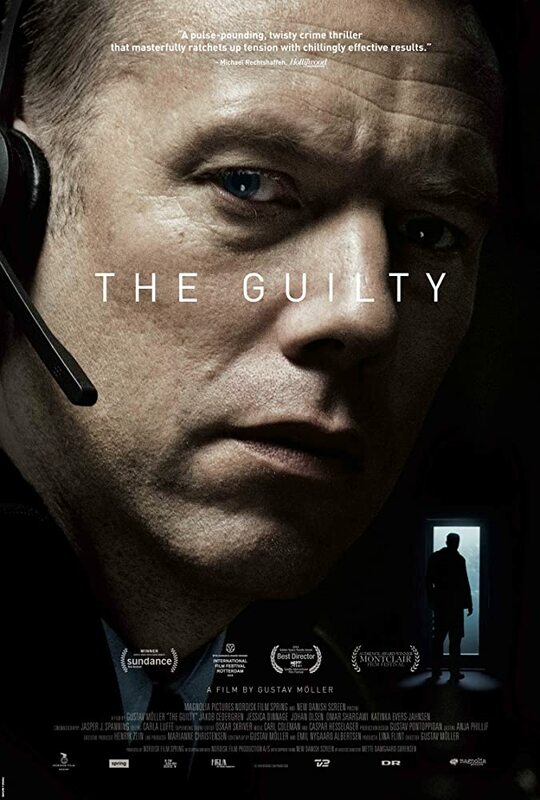 “The Guilty” is Denmark’s candidate for the Oscar for films opening in 2018, an unusual choice since the story is a one-man show with others thrown in, either the guy’s partners in the police precinct or voices on the phone. In a story that obeys the three classical unities—time, space, plot all within 24 hours—Asger is so wrapped up in the panic of one caller that he voluntarily stays overtime to make sure the case is resolved. After laughing off a caller who complains that a woman had mugged him of his cash and credit cards, Asger realizes that the fellow is in a red light district, clearly shown on the computer that the police use for immediate tracking. He also finds little use to continue talking to someone who fell off his bike, scrapes his knee, and asks for an ambulance. Then, everything happens. Asger speaks with a tearful, frightened woman, Iben (Jessica Dinnage) who claims to have been kidnapped by her ex. He is connected with the alleged kidnapper Michael (Johan Olsen), with a girl aged 6 years 9 months, Mathilde (Katinka Evers-Jahnsen) and others. He tries to piece together the elements, horrified to find out that a baby has been killed, cut open by Michael before the kidnapping. You may wonder why Michael would allow Iben to keep her cell phone while she is in the trunk of the kidnapper’s car, but all will become clear by the conclusion.